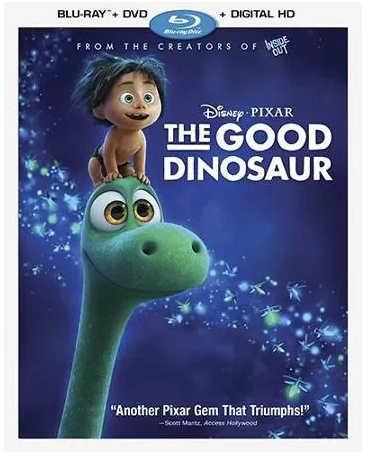 The Good Dinosaur (Blu-ray + DVD + Digital HD) Just $19.99! Down From $39.99! You are here: Home / Great Deals / The Good Dinosaur (Blu-ray + DVD + Digital HD) Just $19.99! Down From $39.99! Right now you can get this The Good Dinosaur (Blu-ray + DVD + Digital HD) for just $19.99 (Reg. $39.99) at Walmart! From the innovative minds of Disney-Pixar comes a hilariously heartwarming adventure about the power of confronting and overcoming your fears and discovering who you are meant to be. “The Good Dinosaur” asks the question: what if the asteroid that forever changed life on Earth missed the planet completely, and giant dinosaurs never became extinct? In this epic journey into the world of dinosaurs, an apatosaurus named Arlo makes an unlikely human friend. While traveling through a harsh and mysterious landscape, Arlo learns the power of confronting his fears and discovers what he is truly capable of. Bring home this original story full of humor, heart, action and imagination, perfect for the whole family!.